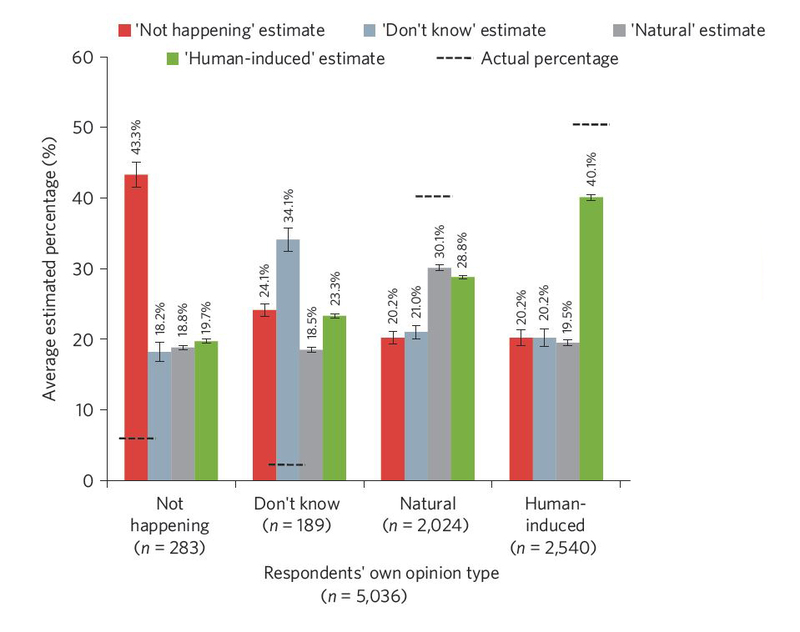 One barrier to creating wider acceptance of policy to mitigate climate change risks is the tendency people have to consider their own opinion to be the most common among the wider population, and to underestimate the number of people that accept the existence of human induced climate change, both among climate scientists and the wider public. This was spectacularly confirmed by a 2013 survey of public opinion in Australia[i]. Previous research carried out in the USA showed that people’s values strongly shape their perceptions of risk (a finding replicated in this survey), and that some personal values can make people resistant to descriptions of the science (see Page 2. of this section). However the new research described here indicates that people may be more willing to respond to descriptions of the consensus among scientists than presentations of the science itself. It would be interesting to see this work replicated, especially as the sample of the public was chosen for convenience (they stopped passing pedestrians) and so may not have been representative of the public as a whole in some respects. It would also be interesting to see such work extended to other controversial topics in other cultural contexts. This could include the science of evolution by natural selection, where in the USA lack of acceptance by those with a strong conflict of values appears resilient to overwhelming scientific consensus clearly communicated over decades. However, as the authors note, their finding fits with other work from the USA showing that among Republicans acceptance of the consensus is the strongest explanatory variable for their own acceptance [iv]. Belief in the ability of individuals to do something effective about the problem was also found to contribute to acceptance of the science. But at least there can now, in view of these findings and those described in Page 2 of this section, be more clarity on the way forward: emphasise the scientific consensus, and the truth about public opinion, use straightforward presentation, including framing the problem sympathetically, use trusted means of communication, targeting especially those who remain undecided on the issue, involve those who have diverse backgrounds and values, and emphasise solutions. No easy task, but at least the basis for a way forward.